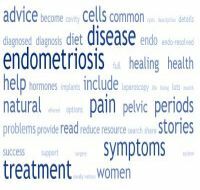 Keeping a diary which records your endometriosis symptoms is a very useful tool. One of the best ways is to compile this diary as a visual chart so that you can very quickly get a 'snap shot' of changes in your symptoms. Draw up a grid of blocks on graph paper following the 28 female cycle, not a calendar cycle. Headings are the days of the cycle 1 to 28. Under those drop down a row of blocks for each symptom you want to chart. If you think things will be cramped using A4 graph paper then sellotape 2 sheets together. Or do it with 2 rows of 14 days. When I did this I charted the 5 main symptom that I wanted to keep track of, using a column of 5 blocks, one for each symptom, and used a different colour felt pen to colour in the blocks in a different way to define what happened. I then worked along the rows, day by day, and a clear visual chart would appear. This enabled me to do a quick ‘view at a glance’, to see how things were going and to see what patterns in my symptoms were developing. I also left a space at the bottom of each colour block to write in simple notes of specific events i.e. the days I took homeopathic remedies, the days I started with any supplements, days in which life had been crap, days in which life had been good, whether it was a full-moon (because I am susceptible to the full moon), appointments with the doctor/medical profession, when I was away on holiday, and so on. Each finished sheet allowed me enough space to chart about 2 months of activity. I could then easily view how things were going and how life events were affecting my health. After a few months you can lay these finished sheets on the floor are start to easily study changes in your symptoms and your health - laying them out one under the other. I could keep an accurate record of my menstrual cycle - I even put in the notes, the time of day that my period started. If I had a bad bout of Irritable Bowel, I would note down what I had eaten to give me a guide of what had triggered it off. These visual notes can be taken to your doctor, gynaecologist or any alternative practitioner you are seeing. It is a quick, simple and concise record of all your health symptoms and is a valuable tool for them as well as yourself. I highly recommend you start to chart your health now; it may give you more clues than you realise. I kept mine pinned to the bedroom wall, above the dresser, with the pot of pens on the dresser. Using different colour pens, and colouring in the blocks, is quick and easy to do, and is much easier to read afterwards, rather than flicking back and forth through a diary.